Stephen Harper will join a team of Conservative ministers in New York this week, although the prime minister will not address the United Nations general assembly while he is in the city. A group of foreign policy experts on Monday urged Harper to take a greater role in the international body. Stephen Harper will join a team of Conservative ministers in New York this week, although the prime minister will not address the United Nations general assembly while he is in the city. Harper will instead take part in a side event on maternal and child health and attend a talk on the economy hosted by the Canadian American Business Council. Foreign Affairs Minister John Baird will instead be Canada's voice at the UN General Assembly, which he will address Sept. 30. "At a time of economic uncertainty, rapid social change and a volatile global environment in which certain regimes are threatening international peace and security and violating the rights of their own citizens, Canada has a vital global role to play in the defence of freedom, dignity and opportunity," Baird said in a statement. "At this year's General Assembly, Canada will work with its partners to encourage the United Nations to be more accountable, transparent and responsive to the challenges of a changing world." The delegation to New York also includes International Co-operation Minister Christian Paradis; minister of state for foreign affairs Lynne Yelich; and Deepak Obhrai, Baird's parliamentary secretary. Meanwhile, a group of former cabinet ministers, senior diplomats, academics and foreign-policy experts is urging the Harper government to re-think how it engages with the UN. They noted that U.S. President Barack Obama is addressing the assembly this week and that leaders from "50 or 60" nations will be in attendance for the opening session. At a news conference Monday in Ottawa, the group also outlined steps the Conservative government could take to mend what they say is a strained relationship with the world body. "We're increasingly denying ourselves a place at the table," said Carolyn McAskie, a former assistant secretary general for peacebuilding at the UN. "We walk out of meetings because North Korea is in the chair. The reason you go to these meetings is so that you can engage all 193 (countries). You don't pick your friends and your enemies.They're all there. You go, you play the game...If you're not at the table, you don't have a voice," McAskie said. The Canadian delegation has in the past left the room when countries such as Iran are at the podium. But the foreign-policy experts say Canada's actions at the UN have done its reputation more harm than good. "Canada couldn't get elected dogcatcher at the United Nations today," said Ian Smilie, who chairs the Diamond Development Initiative. Canada's relationship with the world body has deteriorated sharply in recent years, he added. Smilie faulted Harper for not taking more opportunities to address the General Assembly, noting he was at the UN in New York last year during the opening session and chose not to speak, and the same thing will happen this week. 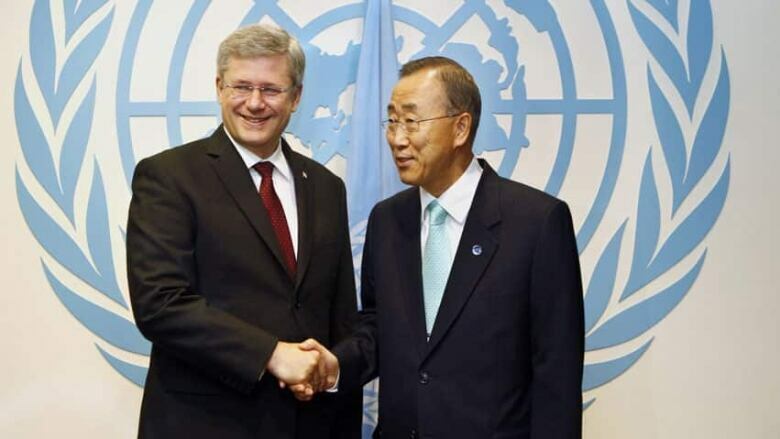 Harper has, however, addressed the UN General Assembly twice, in 2006 and 2010. Smilie said when Canada does speak at the body, represented by Baird, it criticizes the organization. "[Baird] calls it a debating club for dictators," added Smilie. Smilie cited an example of Canada's former influence at the UN 10 years ago, when it chaired the Security Council's sanctions committee on Angola over the issue of blood diamonds. "Until then there had been almost no international notice of this problem," he said, referring to the role conflict diamonds played in funding rebels in a civil war against Angola's government. Canada, said Smilie, took this issue onto the floor of the Security Council and helped organize the global certification program for diamonds. And Canada's participation in UN efforts has declined as well, he said. Of the 83,000 peacekeeping troops in different parts of the word, Canada contributes 56 people, he added. "I don't think any of us could have imagined even three or four years ago that Canada would be in the doghouse as much as it is in relation to the United Nations," Smilie said. John Trent, a founder of the Academic Council on the United Nations System, pointed out Canada created the idea of the "responsibility to protect," a UN directive that focuses on preventing and halting genocide, war crimes and ethnic cleansing. It was also Canada, he said, through the UN, that did most of the work on the international landmines treaty. McAskie said that the group is not calling on the government to change its approach to the UN, but rather calling on Canadians to remind the government that as a member state it has obligations and responsibilities that shouldn't be shirked. This story has been edited from an earlier version that incorrectly reported the view the Prime Minister Stephen Harper has only addressed the UN General Assembly once. In fact, Harper has addressed the General Assembly twice, in 2006 and 2010.